What began as a tragic event morphed into something special for Digital Reprographics Solutions (DRS) in Doylestown, PA. The company already had a Cruse Scanner that was actually purchased at a business liquidation auction. 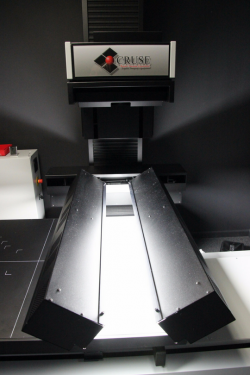 It was a great addition to the DRS in-house machine line up and new service offering of large format, high-quality scanning. The Cruse scanner is widely regarded as one of the best scanners was now commercially available in the Philadelphia suburbs. DRS rolled out the red carpet for the scanner by setting up a special room with dark gray walls (for white balance) in their shop to house the Cruse scanner. This room has attracted a number of specialty clients and projects who were knowledgeable of the Cruse Scanner and the quality levels of its scans. As you can imagine things were going well, very well. Then the misfortune came and made a good thing great! The misfortune occurred when a storm came through Doylestown and DRS incurred a lightning strike which basically disabled and ruined the sensitive electronics of the Cruse Scanner. The fortunate part of the story is that DRS was fully insured for such occurrences. The original Cruse Scanner was beyond repair. As a result, the insurance covered the expense of obtaining a brand new Cruse Scanner from Germany, where they are made. And, since Cruse scanners are custom made, Mark and Mike were able to add features to the brand new Cruse scanner to make it even more powerful and valuable. As a result, DRS was able to obtain the most up to date Cruse Scanner in North America worth over one hundred thousand dollars! What makes the scanner so great? You have to see it to believe it. The scans are incredible with the new lighting kit that can pick up and emphasis shadows and highlights creating an incredible scan. People are now coming from near and far to have their scans done by the new custom made DRS Cruse Scanner in Doylestown, PA.